We served these up neat, pouring them from room temperature bottles into pre-chilled glasses – it’s understood that the standard delivery method is from the freezer, but we didn’t want any of the subtler characteristics to be masked by frozen taste buds. In retrospect a blind test would have perhaps been more fair, but we were quite pleasantly surprised to find that they all had quite distinct and obvious characters. This was good news to me, as I’d pre-announced the tasting via Twitter and would have looked, as a Brit friend of mine might say, “a right pillock” if I’d come back after all the effort and not been able to identify any differences among them. Grey Goose‘s ubiquity is getting it an undeservedly bad rap these days, as can happen to any status symbol that gets co-opted by the conspicuously consumptive classes. The Goose was definitely the most transparent and flavourless of the three, with a bit of a medicinal nose off the top but very light on the palate and a clean finish. Russian Standard had remarkable body and a somewhat oily texture by comparison, with a slightly petroleum-like taste to match. I wish I’d done a blind tasting because I really felt it tasted the most Russian of the three, as though it would be even better in an enamel cup over an oil-drum fire. Of course I was staring at the Cyrillic label at the time. So much for the scientific method. Tito’s was a different experience altogether. It didn’t have the brawniness of the Russian, but a mellower, more rounded presence. I felt I detected a citrus note, though how you get that from wheat-booze filtered through charcoal remains a mystery. There was a bit of heat on the finish of this one, not harsh, but a pleasant burn that I didn’t notice off the other two. Again, I wonder if I would have ascribed such an obviously Texan attribute in a blind tasting. I guess I’m just going to have to do this all over again. And which one ended up on top? I think they’re all lovely in their own ways. Grey Goose has in its near invisibility an almost pre-cablegate diplomatic elegance that would lend itself well to a kangaroo (which those less obsessed with cocktail taxonomy might refer to as a vodka martini). The Russian, with its unselfconsciously hearty nature, would stand up better to the pummelling of the constituent ingredients of a mule or a greyhound (note to self: consider fauna-themed cocktail party). Or if your vodka drinking nights involve a lot of clanking and sloshing of tin cups, it might be the best choice of the three. 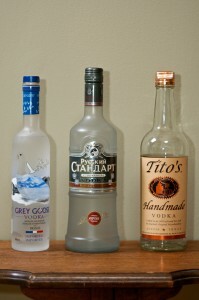 But for a refined aperitif or just a sipper with discerning boozers, I’d lean toward the artisanal charms of Tito’s. We had been introduced to “Uncle” Tito a couple of years ago. It is a bit different but we have enjoyed it from time to time. Absolute, three olive are also on our list of regulars. Today I purchased a bottle of Titos but the petroleum taste and after taste is so strong nether my wife or I can drink it.